I know goals and resolutions are typically shared in January. Now that the year is 1/12th of the way over, I figured it was time I get our annual home goals published! 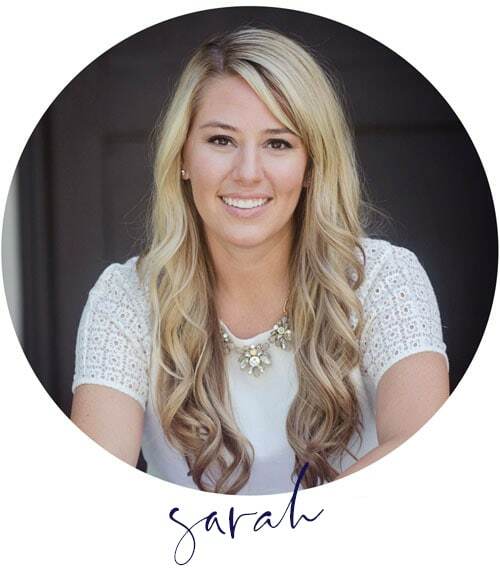 Properties – We had a goal to buy one more rental property, and we ended up buying two because of good timing and availability. Flooring – We replaced the floors in our office, but we are still having major carpet issues throughout our upstairs. Kitchen – Once again, we made zero progress here. But we’re hoping to address this in 2018. Back Patio – Another big fat zero. I did contact some architectural firms and contractors but I didn’t get much response (why are these fields like this???) so this has been placed on the back burner (likely until 2019). 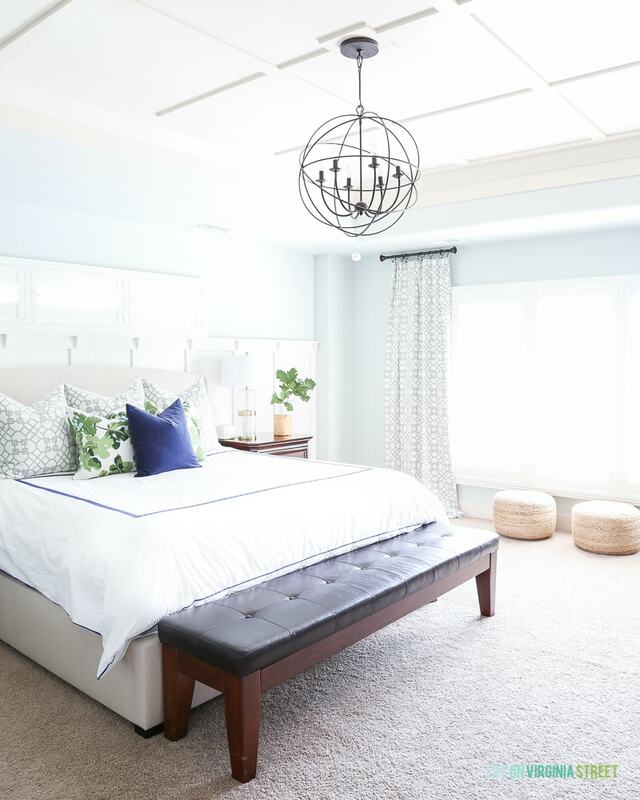 Banish the Baby Blue – I managed to cross this off in the craft room, but still need to move forward with our master bedroom. Hoping this will happen the first half of 2018! Craft Room Updates – This is 90% done! Staircase – We’ve talked about starting this at least 100 times, and here we are today with zero progress. This one requires Kurtis’ participation, so we likely just need to set aside a weekend and make it happen. Whiten the Trim and Doors – Another zero. Unless you count all the trim and doors I painted on my own. BUT, I really want to get someone to remove all our doors and spray them white. I may just have to do the trim myself because I’m not sure how willing I am to pay for it. 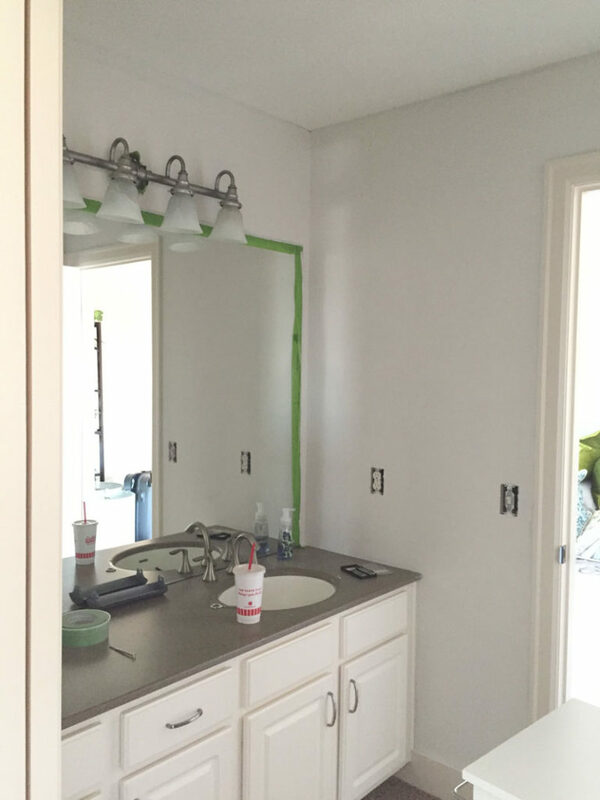 Omaha locals – any good recommendations for painters that could do this? So, after all that being said, here’s what we have planned to complete in 2018! Keep in mind all of the unfinished ones are going back on the list, as well, unless otherwise noted. After I finished the list, I’m coming back to add that this may have to be a two-year plan. So. Much. Stuff! Some just require a little paint, others are full-blown renovations. The Kitchen – This is the biggest one on the list. Basically everything I said on this topic last year holds true. It’s probably worth reading this post to see our initial wishes and changes. They’ve changed a bit since then, but you can see our general thoughts. Kurtis is pushing even harder right now to get this done and I still feel like I have no idea what I’m doing. 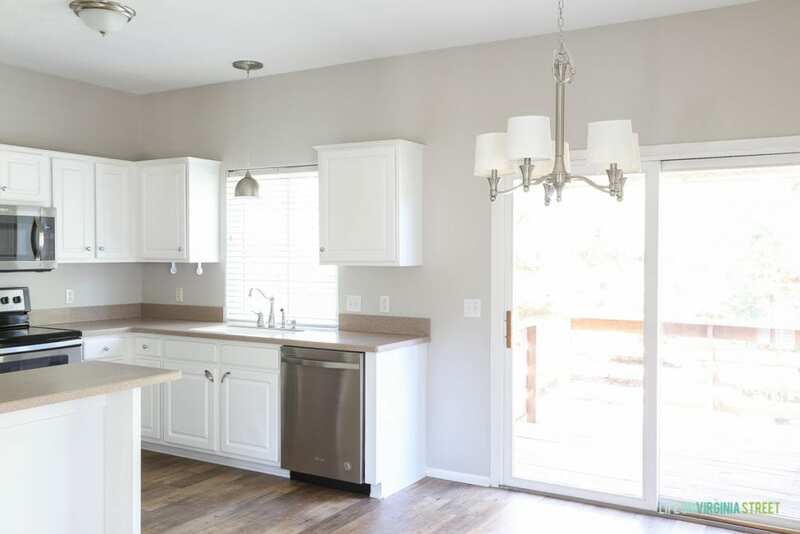 I have a bit of paralysis when it comes to making decisions here that I know are likely permanent since I don’t foresee a second kitchen renovation ever in our lives. At this point, I’ve reached out to a designer friend and a local contractor to get ideas and hopefully start the process. Originally we were thinking a spring project, but it may make more sense to move it to summer since we tend to grill more and won’t actually need our kitchen nearly as much during the summer months. After talking about it at length, essentially since moving in in 2012, we’ve decided that we want to take the island down to one level, have a custom range hood built, replace the thermofoil cabinet doors (several are starting to peel badly), and deal with the random microwave situation. Other than that, we seriously have no idea how to make this all function better. Feel free you tell me your #1 kitchen must-haves in comments! Master Bedroom – I have to finally get the painting done in here after talking about it for two years. The gorgeous board and batten ceiling is still that almond/pink-ish color and I want to get rid of the Sea Salt walls. They both feel way too saturated for my liking. It looks significantly better in photos than it does in real life. I’d also love to find a large rug to place under the bed to add some additional color and cover the beige carpet. 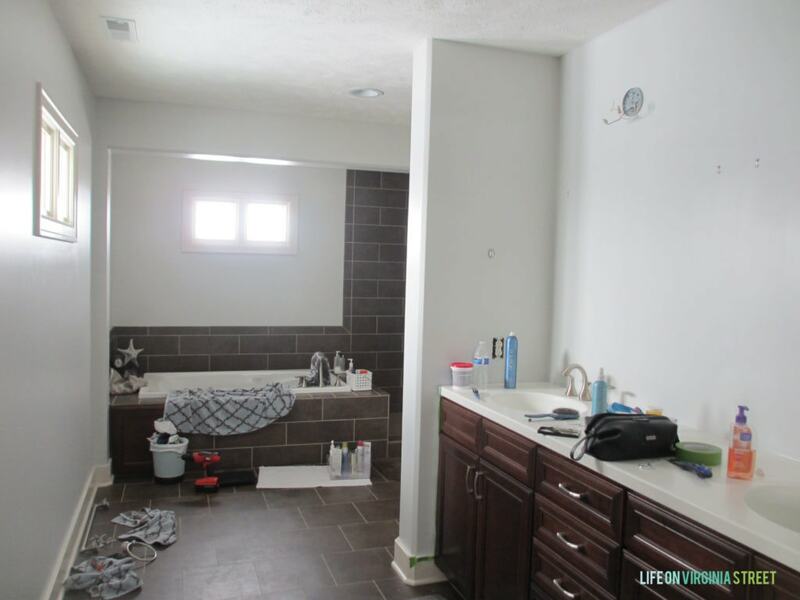 The Bathrooms – By far, the worst rooms in our house right now are our guest bathrooms. But, they’re our guest bathrooms so it’s not something we think about that much. However, in the coming years, we would love to do a renovation in our master bathroom to remove all the dark brown tile, and I’m thinking if we tackle a small guest bathroom first, it may give us more confidence and experience to do the master bathroom right the first time! Here are all three spaces. I realize I’ve never taken a proper photo of our master bathroom after I painted it light gray (keep in mind, I only did one coat and then abandoned the project because I still don’t love the colors together). It looks decent from this angle. 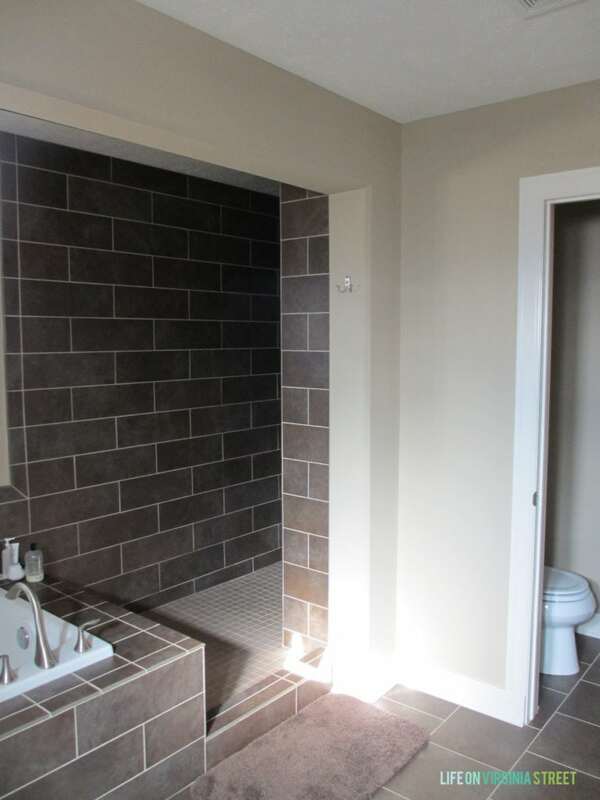 But, there is so much brown tile and the room feels really dark. 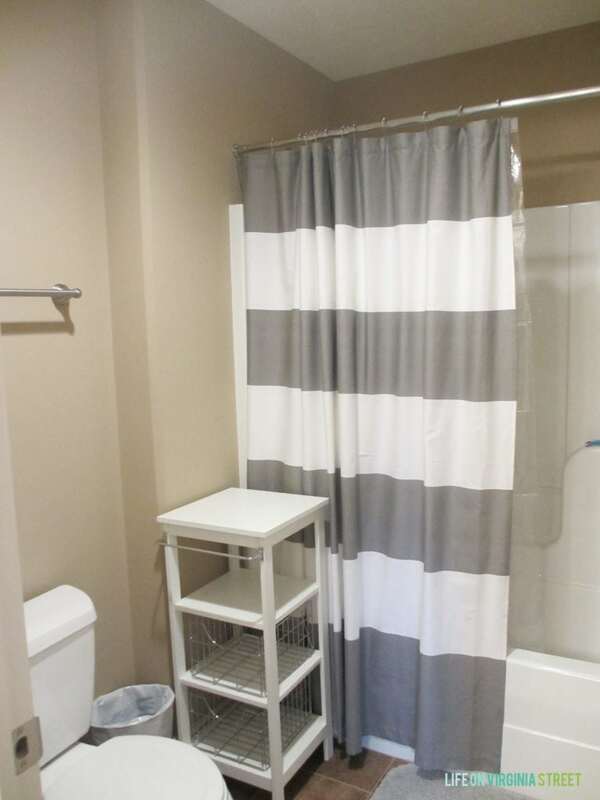 Guest bathroom #1 – Good news! All of that painter’s tape is still up from two years ago when I did the first coat of paint in the Jack & Jill guest bathroom! It should make finishing the job that much easier 😉 One half of the room is carpet (UGH!) 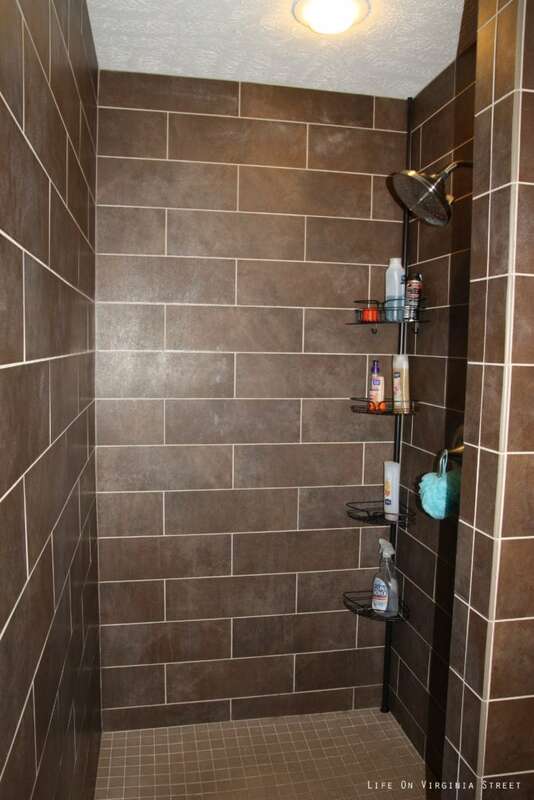 and the other half is dark brown tile. 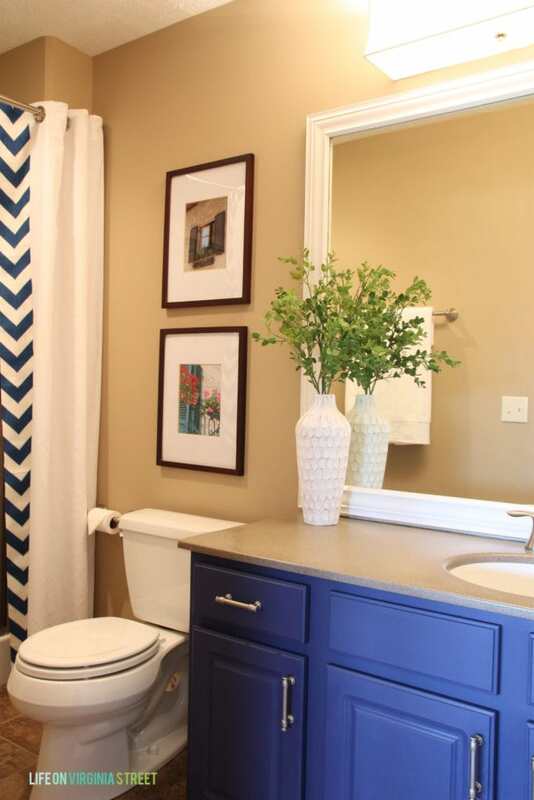 Guest bathroom #2 – Sadly, I’m the one that painted the cabinets that blue color shortly after we moved in. I actually put a coat a gray on them last winter because I couldn’t deal with in any longer. But, the walls have never been painted (and need it badly) and I need to finish the cabinets. And again, with the dark brown tile floors. 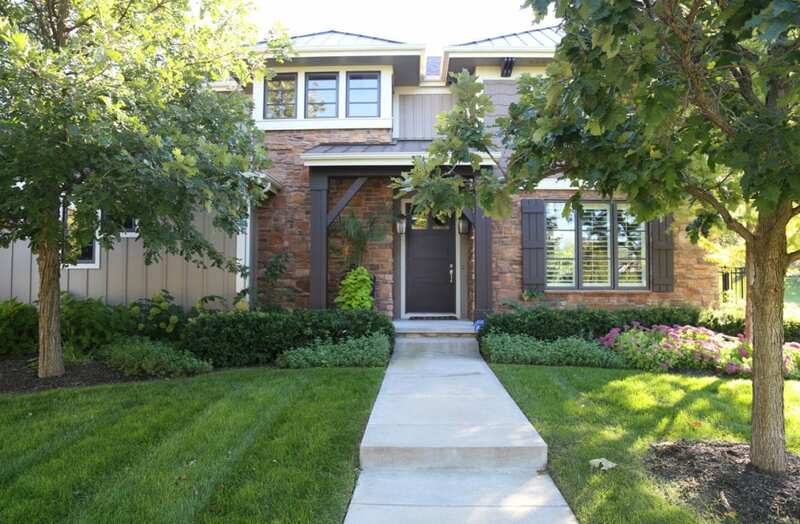 Rental Properties – Kurtis would love to add another rental property this year. Me, I’m iffy on it. We have one unit that will be vacant again 3/31 and another than is on month-to-month, so they could leave at any time (and that one will need to be renovated once they leave). So, unless a killer deal comes along this year (which likely won’t happen in our current housing market), we may just be working on renting the one unit and renovating the other (and then re-renting). 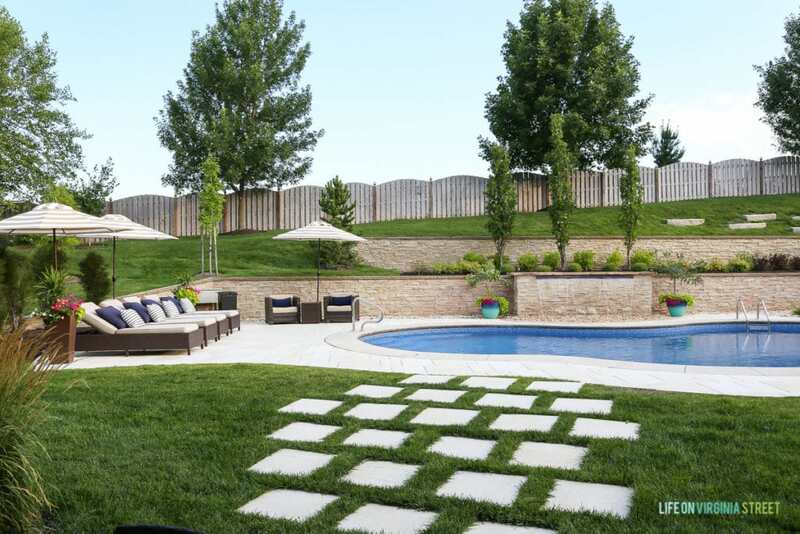 Finish the Backyard Trees – From day one of the pool project, we knew we were going to have to do our landscaping in multi-year segments. It all costs way too much to do all at once. This year, I’d like to finish out the trees on the back fence line by adding in some more evergreens and texture to give a little depth to the area. Since that area is so elevated, we’ll likely go with much smaller trees to get more bang for our buck. This one will just require me getting out to the tree lot when the trees are freshly dug and picking out the ones I want. Hoping this will be done in April or early May! Finish the Living Room – I have the bulk of this space done, but I have the worst part left. I still need to do another coat of paint on the ceiling and I need to paint the window trim. But, I can’t start the window trim until I find new window coverings. Every time I look, I cringe at the amount of money we’d have to spend to cover five windows of this size. But, I need get moving on this so it’s wrapped up by spring. 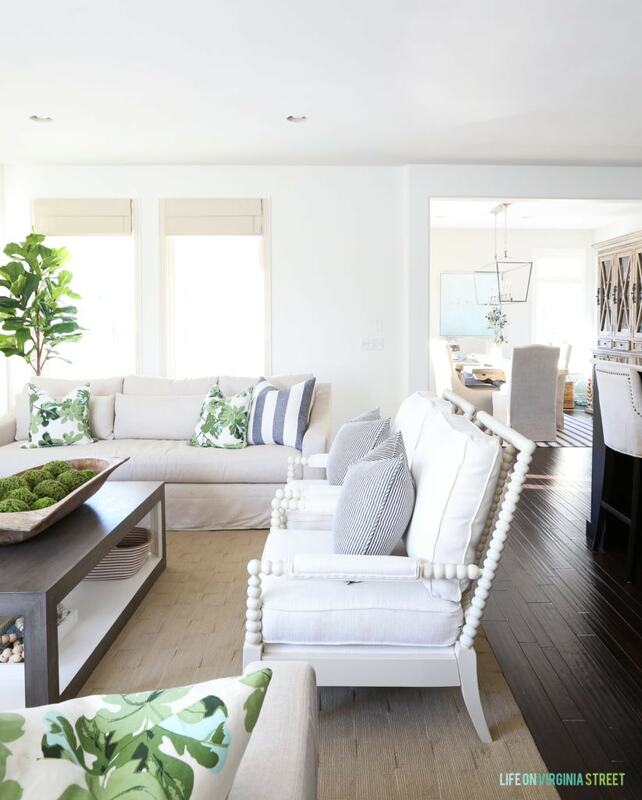 Here you can kind of see the difference between the dining room (painted white trim and custom shades) versus the living room (non-white trim and non-custom shades just nailed into the trim). Paint the Exterior – Our house is ten years old this year, which in Nebraska means it’s time for a paint job. I shared my thought about our plans in my white houses with black window trim post and you can see the direction I’d love to take the exterior since we have to paint anyways! One things for certain – there won’t be a lack of projects to read about on the blog this year! I’m hoping we can make through more than half of our list this year – even if this is the most extensive one yet. Now that it’s already February, I need to get a move on it! Have a great weekend! 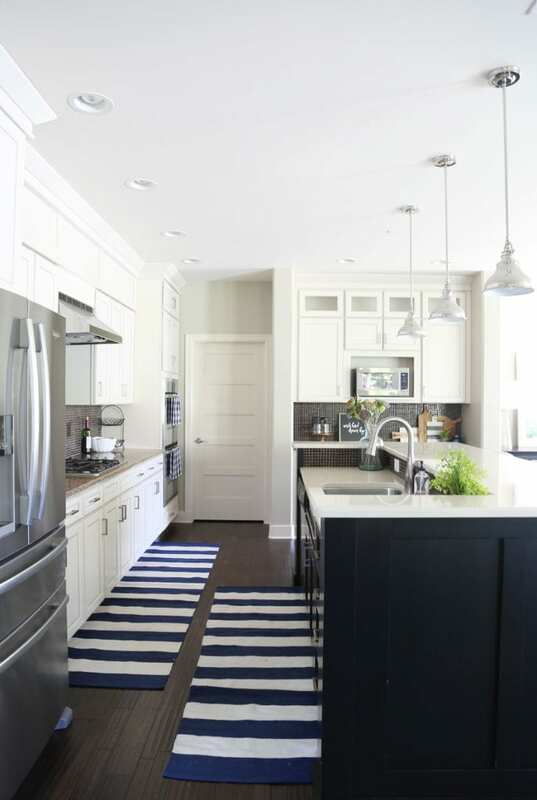 Sarah: your kitchen island would be amazing in the Hale Navy blue paint! Haha! So true! And on the ceiling, I absolutely hate painting it. Definitely cover EVERYTHING because it is a messy process. I had splatters on my face and hair too. I have a post a few years old where I tried a roller with a shield and it definitely helped minimize the mess. But, I remember it getting a bit heavy (which worked in my dining room) but with the size of the ceiling in the kitchen/living room I knew I wouldn’t be able to use it. I had to knock the first coat out over several days because my shoulders would get SO tired. I will try and do a story when I do the second coat! Your home is lovely….LOve the outside and your kitchen….make sure you add plenty of outlets! We remodeled our kitchen 15 years ago…not enough plugs! counter space is big….plan…do you like appliances out?? maybe have them have an “appliance garage”…where they can be stored when not in use….mixer…toaster…juicer…etc. make sure you have room for new things like appliances that might come into your kitchen years from when you remodel. And, pick a good fridge…if you are getting new…or better yet, have it so you can easily replace one…not so built in counter depth that it makes it hard down the road to replace! Can you tell we did ours so long ago? 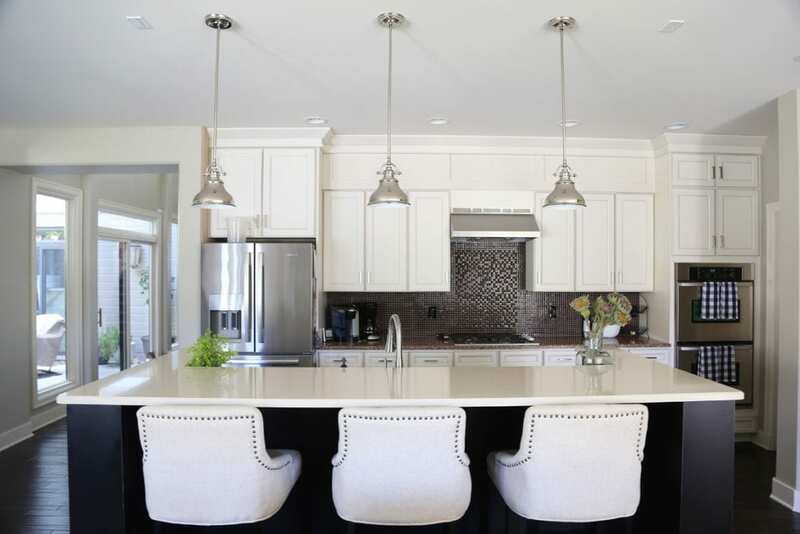 Yeah, we had one of those kitchen design people…and mostly we love it….but,everything is so built in it is hard to replace the large appliances if something goes wrong. Large appliances last 12-15 years…just sayin….and we have already had to replace the dishwasher (get a Bosch..the best)…the oven and soon the fridge….. Speaking of ovens…don’t ever use the self-cleaning feature…just keep up on it with Force of Nature to clean…..self-cleaning kills ovens! Hence why we had to replace ours! Sorry this is long….but you asked. We live in a 1959 house we slowly have fixed up. Storage space is an issue….I’d love to have a “butler’s pantry”…. for more items and storage. So, you are right to take it slow. Gather all pix you love from magazines, pinterest, etc….You will get it just right. This is all such great info Nancy! Thanks so much for all of the feedback! I think your kitchen is very pretty, I love the cabinet colors and the backsplash. Our microwave is on a shelf under our island. I’m pretty sure you are on the tall side, but it works ok for my husband 5″10 and you don’t have to look at it. That’s a great idea Karin! Whew! That is a list for sure! But I will love following along with you as you check off projects!! You have inspired me to start pulling my list together! What a fun list!! Kitchen wishes (a few): pull out drawers, large pantry (walk in preferred), lower microwave ( I used to not understand these until I found out you can get one where you pull the microwave open & lower your dish in. ), pull out trash drawers, lots of outlets, counter depth appliances. We had a upper & lower bar area in the kitchen. We made it all upper and I love all the work space. Since you have a sink in your island I like that it is high & low. That way you can hide dirty dishes if need be. Good luck on your list. Can’t wait to follow along!! Thank you so much Renee! And great kitchen ideas! How about removing the upper cabinets on each side of the current stove hood? Then switch the backsplash to basic simple white tiles all the way up the wall. Then add the new stove hood. Move the microwave to the new kitchen island. In the new island — consider adding pull-out drawers for storage! 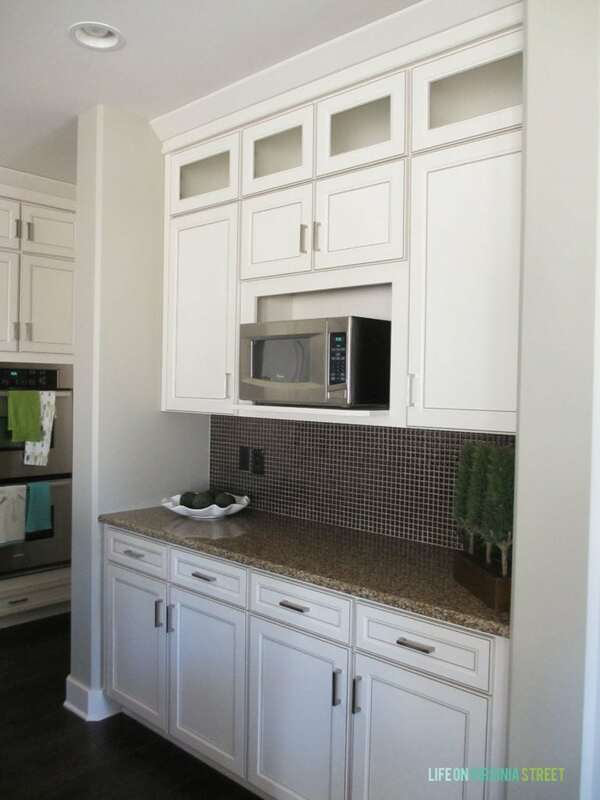 In your current microwave wall – switch to full-length cabinets. Check out Rev-A-Shelf pullout shelves to maximize storage in all of the kitchen cabinets and in the new island! Rev-a-Shelf was our Best design investment ever! We even put them in our old bathroom cabinets too! 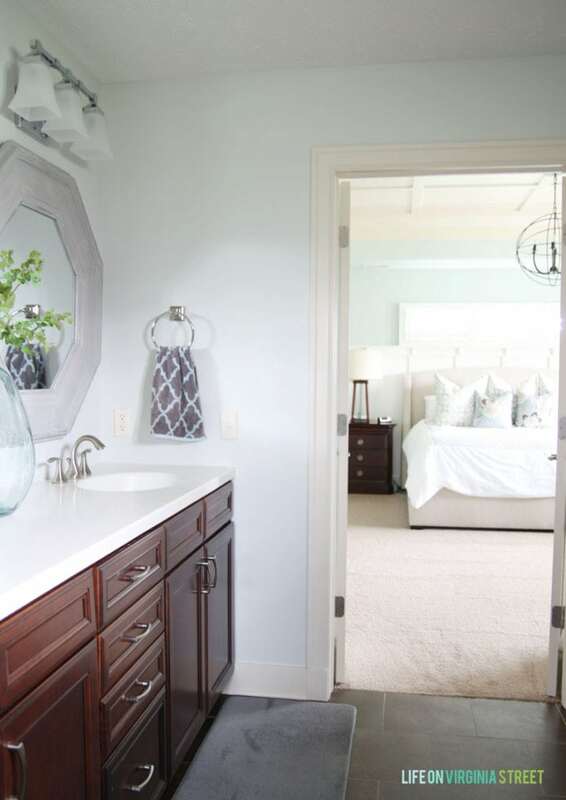 As for the bathrooms — simply paint everything in fresh bright white. Easy. Fresh. 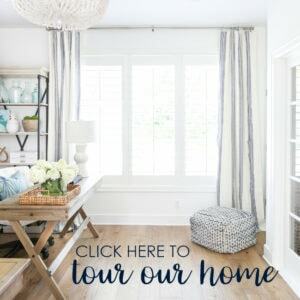 And your master bedroom? Add a long white cushioned ottoman to the end of the bed. And Lucite and brass curtain rods to hold simple white sheers! Thanks for all the great feedback and ideas Jan! And we love Rev-a-Shelf too! We have their pull-out garbage cans and absolutely love them! Limit the number of lower cabinets, instead install deep drawers, drawers and more drawers. It makes life so much easier! I just love your blog – I LOVE THAT YOU STILL HAVE PAINTERS TAPE UP. I think your home is gorgeous, I definitely find it a huge inspiration to me as I muddle along trying to keep our house fresh. Thank you so much for the peek into your plans . . . I may get around to calling the countertop supplier this week with this inspiration! Hi! I love the mirror in your master bath. Do you have source info? Thanks for sharing!!! Thank you! I actually got them from HomeGoods a few years ago. Sorry!